Every afternoon about 2pm I can hear the sound in the distance. It starts as a faint tinkle that you might confuse with the wind chimes across the street but it doesn’t take long to realize it’s a sound from my childhood heralding the ice cream man. I hadn’t heard that sound in years and it takes all the willpower I have to not run outside in my bare feet with my quarter (kidding!) and stand in a line I know must be 10 kids long just to get my favorite cool and creamy treat. 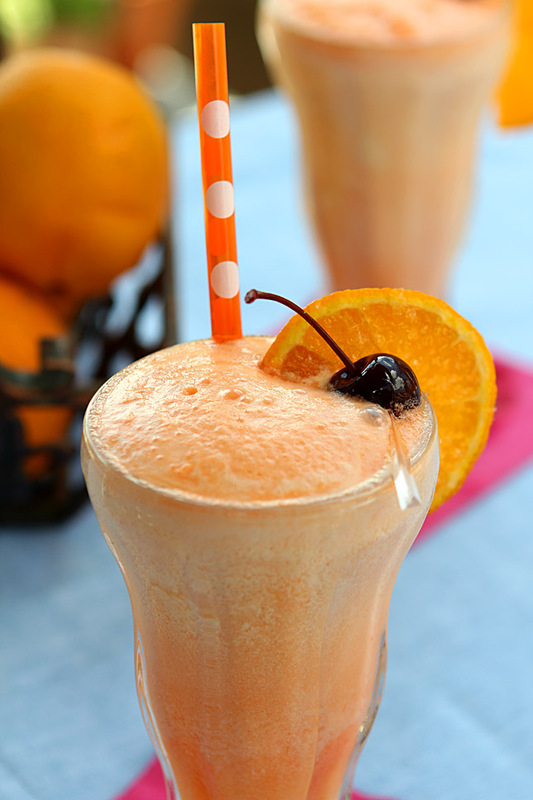 An Orange Creamsicle. I never wavered; it was always the same thing. Something about the combination of creamy vanilla ice cream and the bit of tang from orange sherbet always did it for me. Is it any wonder that as an adult I would have to ‘boozify’ it and make an adult Orange Creamsicle Cocktail? I used a new vodka for this treat. VDKA 6100 Vodka is backed by Australian casino mogul James Packer and actor Robert De Niro. De Niro is quite the entrepreneur and has significant investments in Nobu Hospitality Group, Tribeca Grill, Locanda Verde, and the Tribeca Film Festival (which this year served as the launch event for VDKA 6100). He is known for taking an active role in his investments, which may help keep VDKA 6100 from being yet another celebrity spirit. An interesting note to this vodka is the use of whey as source material. While vodka can be made from any number of materials including wheat, corn, potatoes and rye there aren’t a ton of restrictions on the source materials you can use. Distillers can use pretty much anything that can be broken down into fermentable sugar as the source for vodka, as long as it’s distilled to near neutrality. While whey isn’t a very common vodka source it can be transformed into alcohol with the right kind of yeast. Although it has an Australian inspired name from the country code 6100 for Perth, Australia (Packer has major properties in Perth), the vodka itself comes from New Zealand, where the whey is sourced from grass-fed cow’s milk. The tasting notes for this vodka begin with flavors perfect for this cocktail; lemon, vanilla and powdered sugar. While some reviewers think it has a strong acidic finish (maybe too strong), using it for this cocktail eliminated that factor in my use and it provided the zing that was needed to be present in a drink made with ice cream and soda! They were perfect; cool and creamy and tangy with orange and just enough vodka and orange liqueur to elevate them from ice cream bars to cocktails. Easy too. What are you waiting for…bet you can hear that same music I did and these are a fun way to take a trip back in time with an updated treat. A favorite childhood treat in a grownup cocktail. Combine vodka, orange liqueur, orange juice, vanilla ice cream, orange sherbet and ice cubes in a blender and blend until smooth. Fill chilled glasses 3/4 full and top off each glass with orange soda. I was provided with a bottle of VDKA 6100 Vodka however all commentary is my own. What do you do with the juice? It’s in the ingredients, but not in the instructions. Just blend it with everything else? Yikes! Yes, it gets blended with all the other ingredients; thanks for the catch, I’ve fixed it now. Enjoy! Would probably be the only thing I would even consider but them even better? I’m going to soon as I can have a cocktail blog! Oh wow, this sounds too good! You have outdone yourself with this! We have an ice cream van that comes daily. Lately (we are having quite a hot summer, for a change) he has had some competition and up to 3 different ice cream vans have been driving down our street in a day! Oh this might be my favorite cocktail of yours yet– creamsicles are my all-time favorite ice cream truck treat and I haven’t had one in ages. I love this grown up version! When I was a kid, our house was near the end of the ice cream man’s route and on too many occasions, the only thing he had left were creamsicles. I did without because I didn’t like them. 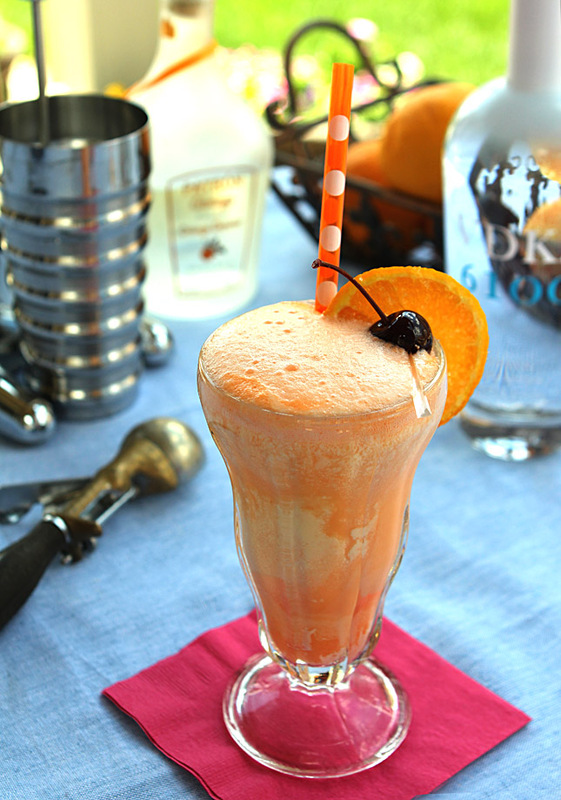 I’ve grown up since then and I’d love this creamsicle cocktail. A drink called a “spider” was popular here in Oz when I was growing up and was basically just soft drink with a scoop of ice cream. One of my favourites was the orange version using Fanta, an orange soda pop. This looks like a much more adult and sophisticated version of that – and has me wishing for hot, summer afternoons and a big glass! Actually, it’s been a tough week for me – I think I’ll take two. I’m a creamsicle fan, too. But this looks much better than the stuff on a stick! Love this idea — very original. Thanks. What a beautiful summertime dessert drink. I need one or five after the week I’ve had! Seems a lot of folks had tough weeks and this libation might just help. Ah, for me it was orange push ups!!! Like you, I never wavered either – had the same treat each time!!! Wow, Vodka made from whey – that’s amazing and a great solution to the glut of whey all this greek yogurt is creating! This sounds like the perfect indulgence for a hot, steamy afternoon – and you know, how are you gonna get any work done anyway??? I had to be careful with this one…it went down VERY easy! When I know I’ve made an indulgence that might be like that I make a point of remembering to down a big glass of water first so my thirst is quenched and I don’t guzzle!